The irony is clear: the more magnificent the production of Puccini’s La Boheme, the more agonizing it is to watch the story approach its inevitable conclusion. When it comes to the heartbreak and, yes, agony of acclaimed British director John Caird’s new production opening Houston Grand Opera’s season, the whole thing ought to be against some kind of law. Given a taut, believable story built on characters we actually care about, Caird seems to enjoy every delicious collision of the raucous and the tragic – which Puccini piles into each of his youthful opera’s four acts. In fact, I doubt the funny parts of La Boheme – starving artists in Paris in the late 1800s cavorting, eating and drinking when they get a little money, ducking the landlord looking for rent – have ever seemed funnier. By pulling that off, Caird manages to focus the spotlight even more intensely on the doomed love at the narrative’s core. La Boheme lacks the layers of character, incident and emotion that this director handled so masterfully in launching Les Miserables on an unsuspecting world back in 1985; you might say he brings this new Boheme layers to spare. 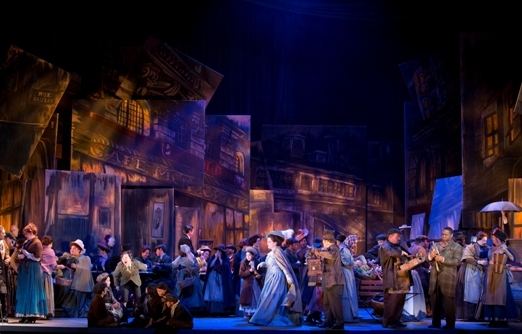 In his dramatic mission, Caird gets extraordinary support from the set design by David Farley and the lighting by Michael James Clark, which take the art being created by these very same “bohemians” in Paris at the time to heart. The entire set seems a series of paintings on canvas, some that remain stationary as frames for the action, some that turn in place to evoke scene changes, and others that drop in or fly off on cables to complete each desired picture. You might say it’s all painterly or even “pixolated,” which in a sense it is. It gives fresh meaning to the appropriate notion of “cubism,” and is breathtakingly lovely to look at too. Vocally, the opera belongs to American soprano Katie Van Kooten, who took on the role of doomed Mimi at London’s Covent Garden last year. At times, Van Kooten’s voice is almost too big to emanate from the usually small and preternaturally fragile Mimi – as though her swelling, hall-filling notes found their way into La Boheme from some other opera. Her portrayal works nonetheless, perhaps pointing out to me for the first time that while Mimi’s days on earth are numbered, she herself says her love is “immense as the sea.” From the center of her weakness and disease-stricken palor, we hear and we sense, in a fresh way, her boundless love. As Rodolfo, Dimitri Pittas’ well-modulated and graceful tenor occasionally gets lost when it runs into Van Kooten’s firepower, as it has to in some of Boheme’s most memorable romantic moments. But Pittas delivers when it counts, such as in Act I’s signature aria “Che gelida manina” or in his wrenching duet with Mimi in a snow-drifting dawn in Act III. No one seeing the unrelenting believability of this encounter could doubt the viability of musical drama, even when elsewhere it might seem silly and senseless. In a lifetime of Boheme-going, I suspect this version of Act III is the most powerful I’ll live to see. The rest of the cast, led by painter Marcello and his buddies Schaunard and Colline, is nothing short of amazing. Their ensemble work is terrific, the comic touches especially, which (as with the larger production) serve to underline Marcello’s jealous rages at his love Musetta and, of course, Colline’s justifiably famous farewell to his beloved overcoat, sold too late to buy medicine and other care for Mimi. Joshua Hopkins, Vuyani Mlinde and Michael Sumuel deserve high praise as these high-spirited buddies, as does HGO alum Heidi Stober as the flirt-with-a-heart-of-gold Musetta. Her “Musetta’s Waltz” in the middle of the Latin Quarter on Christmas Eve is here, as it ought to be, an audience favorite. 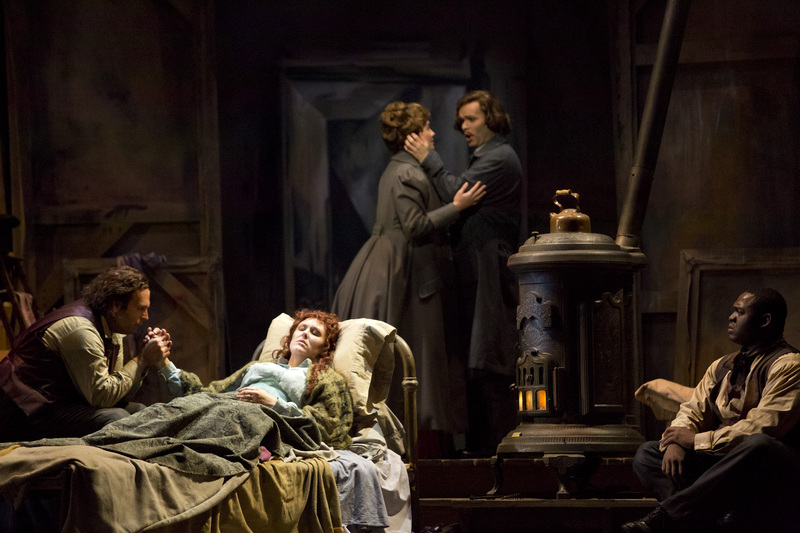 The HGO orchestra, conducted by former HGO Studio artist Evan Rogister, finds its way to the heart of the story in ways that make La Boheme one of the most eternally affecting operas in the repertoire. In more ways than one, each generation gets the musical it deserves. And in the case of better, more successful musicals that take on a certain iconic status, that could mean a fall from grace, for a while or forever. For a wandering, never-quite-there musical like Frank Wildhorn’s Jekyll & Hyde, however, that might mean showing up as one thing the first time and coming back later as something else. Thus we have the latest edition, built around handsome American Idol runner-up Constantine Maroulis, now on display at the Hobby Center via Theatre Under The Stars. “The Strange Case of Dr. Jekyll and Mr. Hyde” by Robert Louis Stevenson may be one of the greatest stories ever told. But this is far, far from one of the greatest musicals ever heard. Yes, the show has two significant female roles – the strumpet Lucy played by Deborah Cox and the nice girl Emma played by Teal Wicks (yet another duality!) – but the evening belongs to Maroulis. After all, he gets to sing the best song, “This Is the Moment,” and he gets to have the most fun running, jumping, swaggering and snarling. His acting, in fact, is quite persuasive as the now-famous dual sides of a single personality. Maroulis plays the soft-spoken London doctor perfectly well, but then does even better as the leering Troy Polamalu of a big-hair Mr. Hyde. The trouble with this role, however, is the trouble with the entire show: it’s one breathy showstopper after another, except that some of Wildhorn’s songs couldn’t stop a Slinky. Nothing is merely pretty, nothing is merely funny, nothing is merely useful; each time Maroulis opens his mouth, he’s screaming and shouting for the top of the Hit Parade. With his high-pitched, high-volume rock voice, the whole thing ends up being “Guy Songs” by somebody like Andrew Lloyd Webber, as sung by somebody like Aerosmith’s Stephen Tyler. Sadly, the girls have it even worse. Any one of their songs could be a hit – and indeed several have been, in the distant past, for the original Lucy, Linda Eder. Songs like “Someone Like You,” “Once Upon a Dream,” “In His Eyes” and “A New Life” are all cut from the same cloth as “Defying Gravity” in Wicked – big and belty, with a huge finish full of loud drums. Truth is, in a good show, there’s only room for one “Defying Gravity,” and it had better be at the end of Act I. Despite the efforts of Cox and Wicks, Jekyll & Hyde ends up being an album of different people singing pretty much the same song. 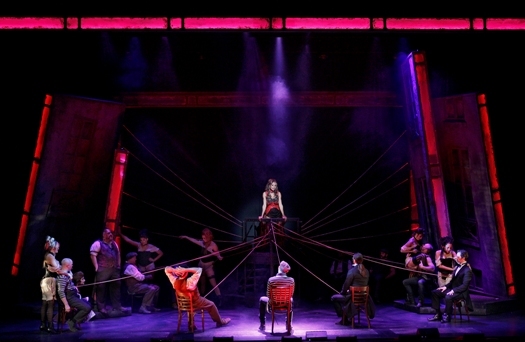 Like everything else by Wildhorn, this “new concept” of the show is eternally on its way to Broadway, and it does have some things to recommend it. There are plenty of projections, for instance; and while they may remind some of this composer’s awful Civil War that played the Alley (scruffy boys in blue and gray singing for hours in front of a Mathew Brady slide show), they are often quite effective. Stage director Jeff Calhoun – who did such a great job with Deaf West’s production of Big River – has an impressive set and much stage business to be proud of. In the end, however, this generation’s Jekyll & Hyde is another episode of American Idol. It’s cocky, contrived and conceited, every song pretending it’s the greatest moment of them all.